Aaron Cook Dot Com ™ - Life, Blogging, Money. 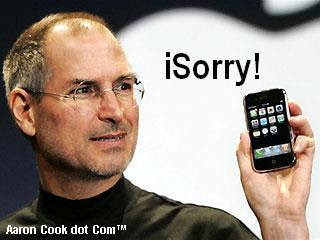 : Steve Jobs Apologizes To iPhone Customers - Says iSorry! Steve Jobs Apologizes To iPhone Customers - Says iSorry! So what happens when you charge people $599 for the most advanced iPhone model, then unexpectedly slash the price by $200 in an effort to boost holiday sales? You have to say iSorry! After receiving hundreds of email complaints, Apple CEO Steve Jobs wrote a letter acknowledging that they upset customers by cutting the price of the iPhone's 8-gigabyte model from $599 to $399, and apologized for disappointing them. Apple also agreed to offer every iPhone customer who purchased an iPhone from Apple or AT&T, and who isn't receiving a rebate or any other consideration, a $100 store credit towards the purchase of any product at an Apple Retail Store or the Apple Online Store. While this may not be the perfect solution, at least it's something of considerable value. And it goes to show that if you're not happy with something it's worth taking the time to contact the company to let them know how you feel. Remember, the squeaky wheel always gets the grease! Well at least Apple is doing something to rectify the situation. I still think it was pretty lame to make such a huge price cut so quickly. Then again, I never thought the iPhone was worth anywhere near the initial $599 price anyway. I completely agree Tom. And I still don't know why people have to run out and buy something the very second it's released. It's a huge wast of money that could be used for much better things. I'm at least glad they offered this. I think it was a commendable move on the part of Apple. I totally agree. Too many companies fully dismiss customer complaints these days. I'm glad that Apple stepped up to the plate...even though it was probably pretty much unavoidable since there were so many complaints. But nonetheless, they recognized the right thing to do and did it. Let's hope that this sets an example for other American companies to follow. yes, let's hope. But I won't hold my breath. i def would be furious if i had bought one!!!!! :D this time i think iSorry is not enough!! Exactly Rod. The money goes right back to them no matter what. That's one reason I never liked when companies gave out store credits. It's kinda like, "Hey, we really messed up. So come and give us your money again." Never liked that approach. But companies are self-serving. They never do things out of the goodness of their hearts. They're always looking for a way to profit. That's why once a company messes up with me I never buy from them again...ever.